These connectors mate with any other standard DB-9 connectors. The DB9 connector is commonly found on computers, electronic devices, DAQ equipment, and industrial controls. On PC's, DB-9 connectors are typically used for RS-232 serial ports. 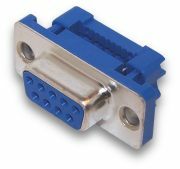 The insulation displacement (IDC) contacts on these connectors allow them to be quickly and easily crimped onto 9-wire flat ribbon cable. A strain relief clip is included with each connector. The Standard Unthreaded Mounting Holes are useful when mating to an existing connector which contains jack screws. Standard #4-40 machine screws may be fed through the unthreaded mounting holes of the CNI connector and into the jack screws of the mating connector in order to secure the connection. The Threaded Inserts are useful when panel-mounting these connectors or when simply installing jack screws without panel mounting. Captive screws compatible with these IDC DSUB connectors may be purchased from Winford Engineering. These are very useful for fastening the DSUB connectors to mating equipment. They may be used with DSUB connectors which have either the Unthreaded Holes or the Threaded Inserts hardware options; however, they work particularly well with the Threaded Inserts, which conveniently retain the screw until the time of installation. NOTE: The captive screws should be installed in the connector BEFORE the strain relief is installed. After the strain relief is installed, installation of the screw becomes much more difficult. 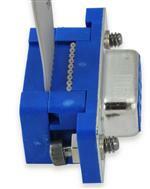 Click here for the captive screw ordering page.